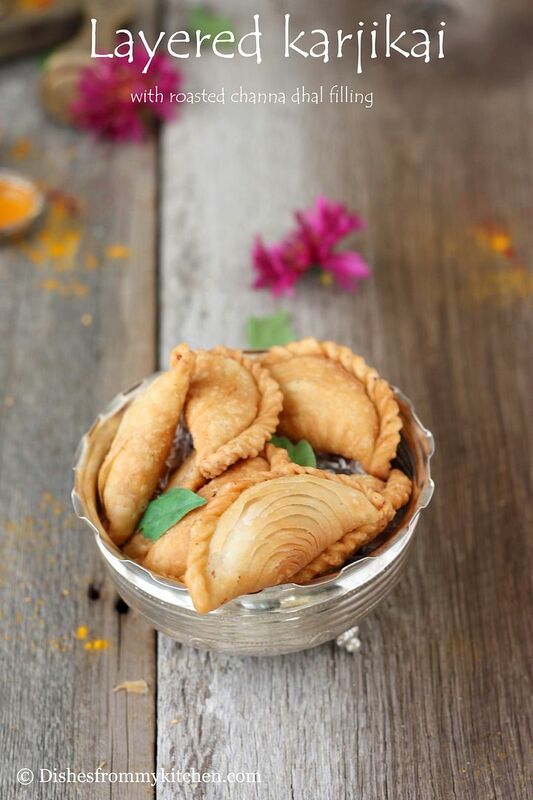 Karjikai/Karjikayi/Kajjikai/kajjikayalu is a traditional sweet prepared during diwali and Ganesh pooja. 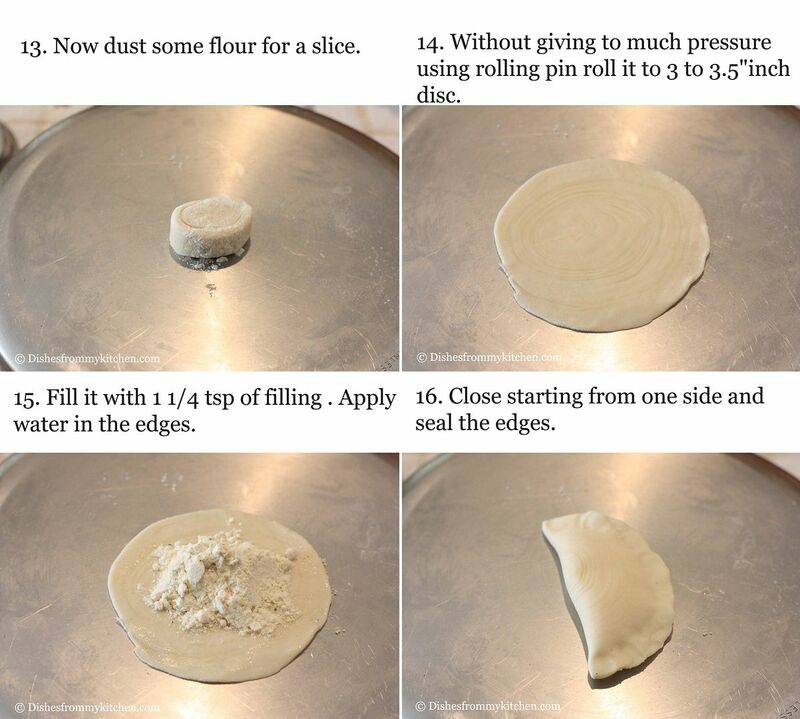 It is prepared by making small balls made out of all-purpose flour. 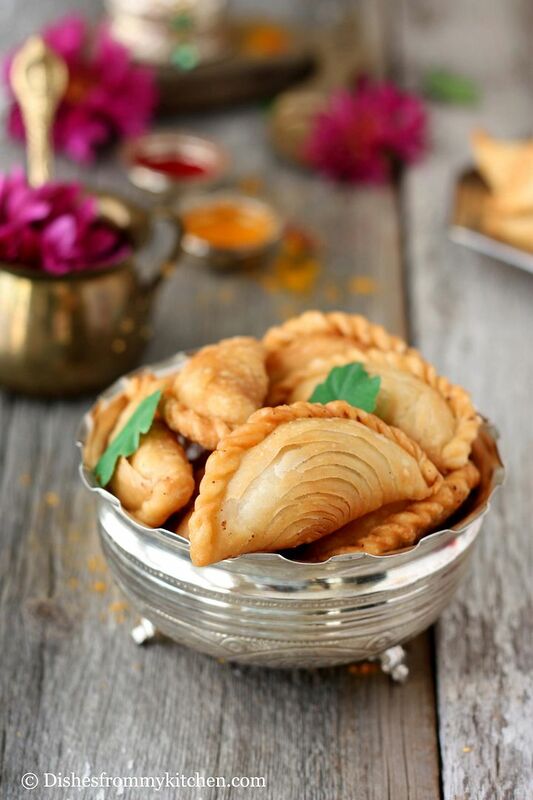 The small balls are rolled into thin puris and filled with a variety of fillings and deep fried. This can be stored for even 20 days in an air-tight container and it stays fresh. 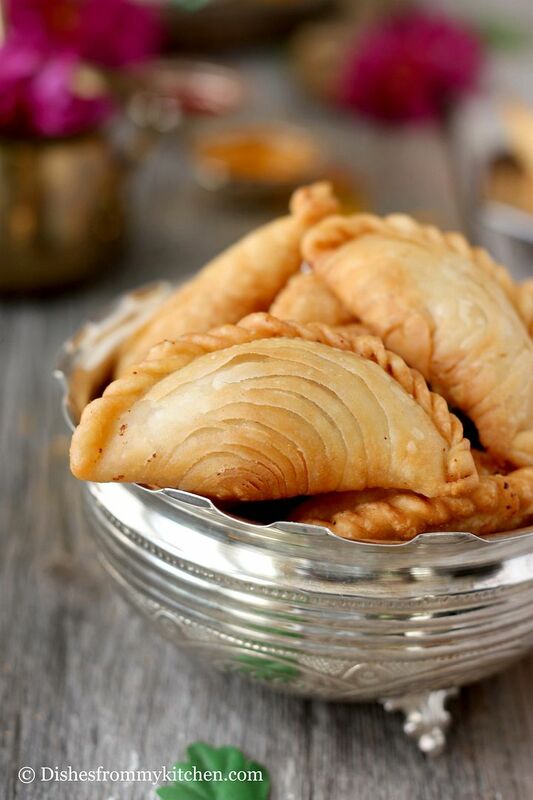 There are different variations in the filling and every one follows their family recipe or tweaks it according to their liking. 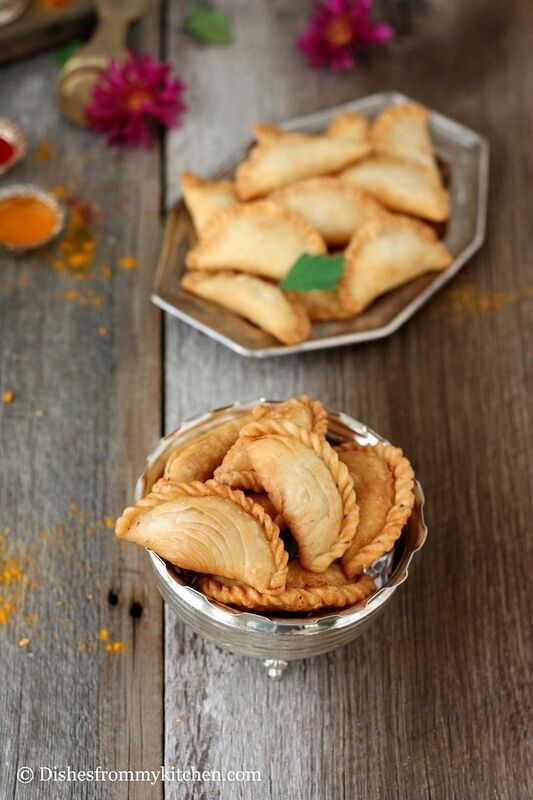 Whatever the name and variation they are super delicious with light crispy layer and delicious sweet filling. I bet you can't stop by eating one. 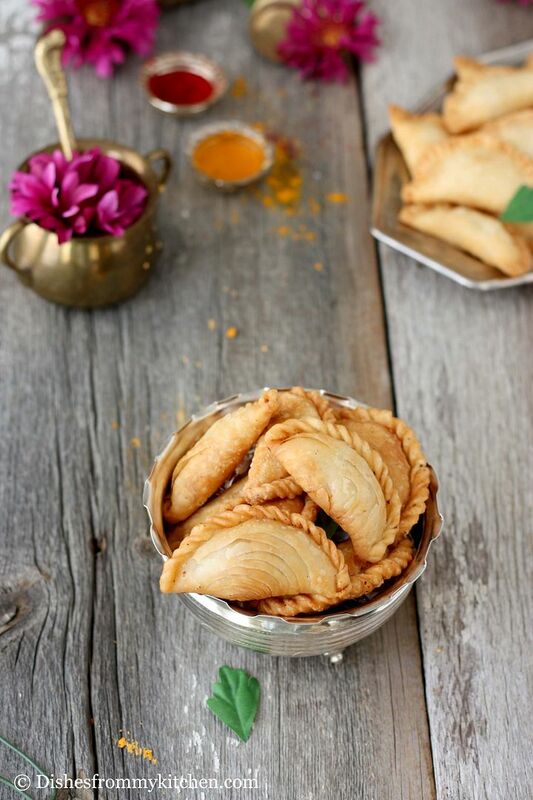 I made 2 types of Karjikai with different filling before the day of Vinayaka Chavithi. 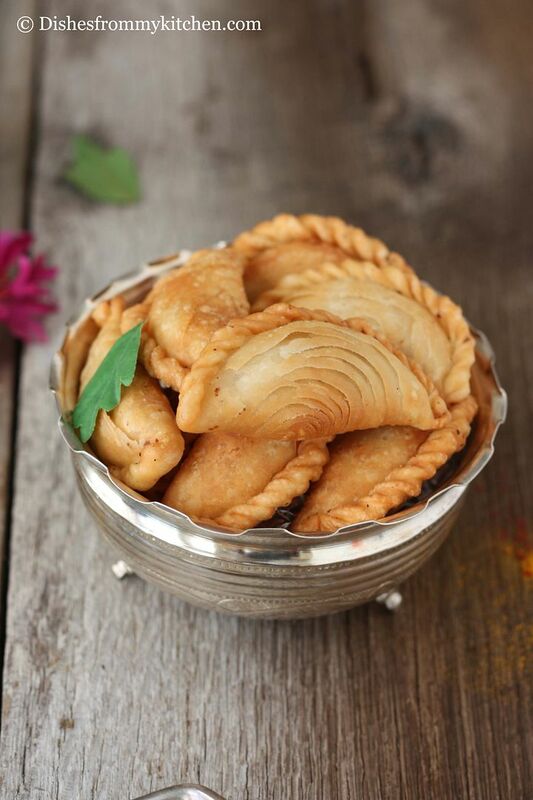 If you want to make plain Karjikai do take a look at this post KARJIKAI WITH COCONUT FILLING. Extra ghee/brown butter and flour for brushing in-between each discs. 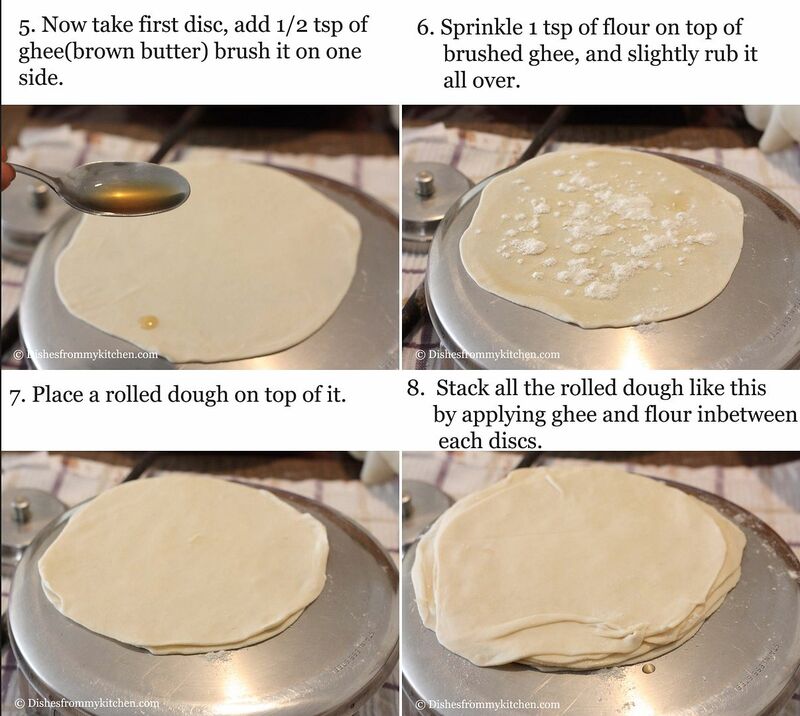 You need 1/2 tsp of ghee and 1 tsp of flour for each layer. 1. Powder the roasted gram and sugar together. 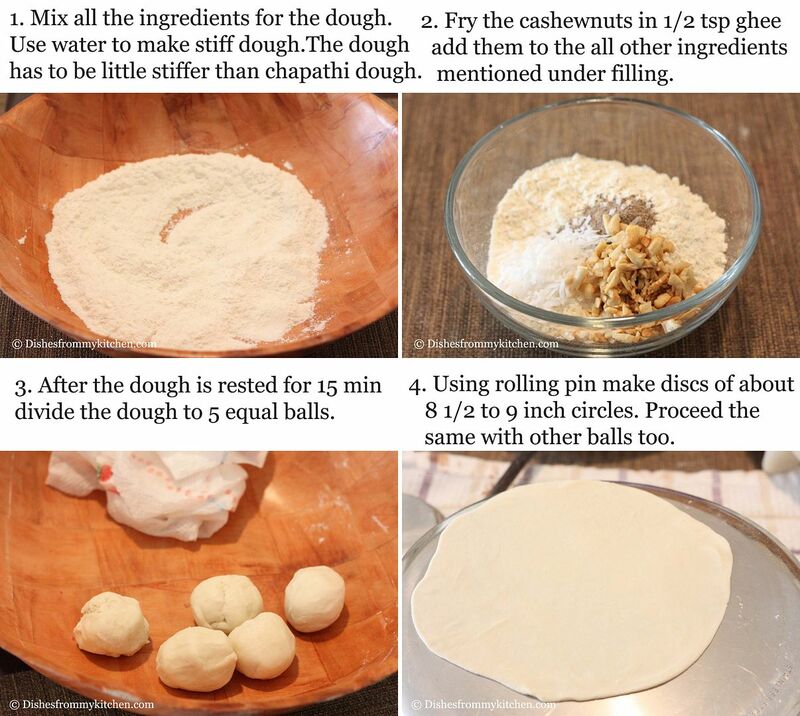 Chop the cashews into small pieces. 2. 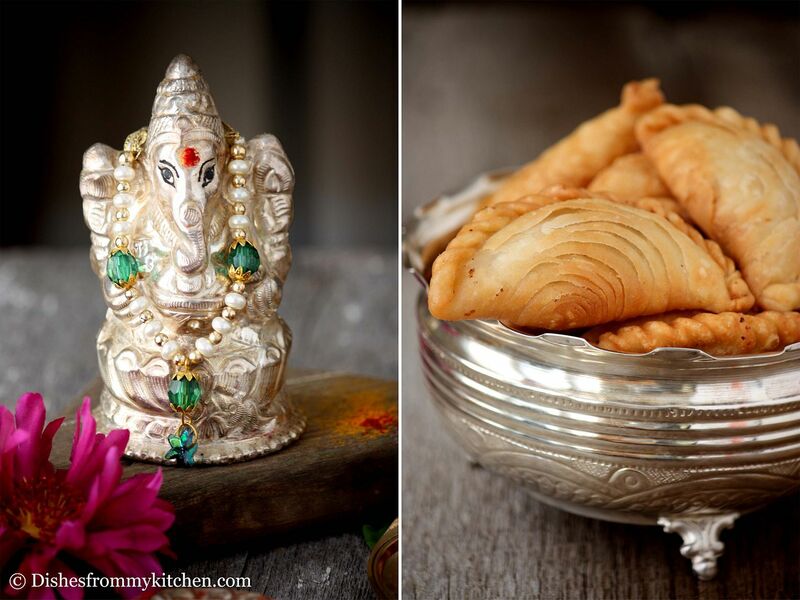 Take a pan and tsp of ghee in it and roast cut cashews for few minutes until the cashews turn golden brown. 3. Mix all ingredients in a bowl. 4. The filling is ready. Keep this aside. 2. 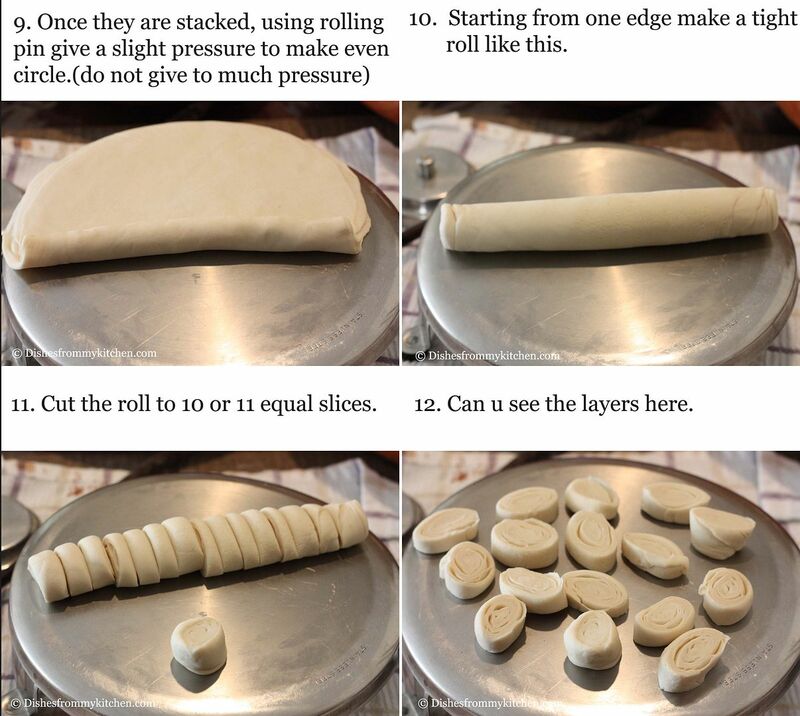 You can also use rice flour instead of all purpose flour for sprinkling inbetweet 2 layers of the rolled dough. Personally I like to sprinkle all purpose flour(maida). Ever since you posted pictures of these on your Facebook page for Vinayak Chaturthi, I was very curious to know how you made the concentric circles kind of pattern on the cover. Now I get it, and I think it is a fantastic idea to add a little twist to the plain and simple outer coverings! Wow wow wow. You rock :) Loving this totally. Love it Love it.. Love the layers. I have never seen one made in layers like this! !you are such a pro in pleating these. can't believe how perfect they look. Looks fantastic Pavithra. I couldn't take my eyes from the snaps.. Fabulous!!! Loved the layers in them!!! Pavithra,...both the recipes looks yumm. u have done a wonderful job. love the beautiful clicks..simply love it. 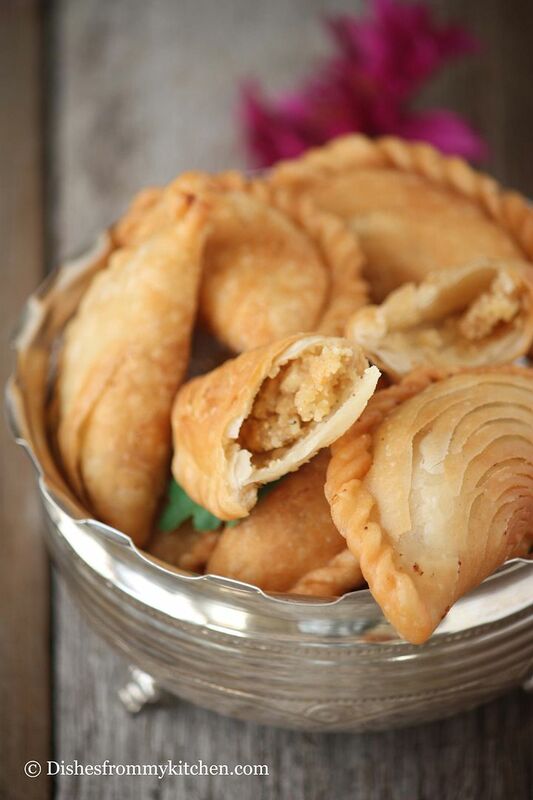 Beautiful karjikai...yummy and inviting clicks..
Looks superb with the layers. Wow,, so impressed with the layers!!! 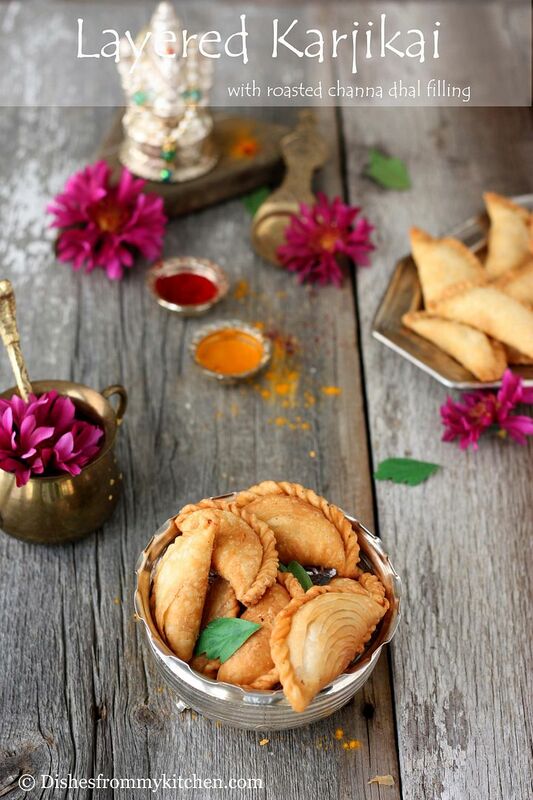 Dear Pavithra...this post proves both your talents - photography and cooking ..you have done a really good job...I also like your step by step pics!! Love everything here !!! Lovely clicks and well explained pictorial..